The action of the musical Aida begins and ends in the Egyptian wing of a major museum. Costuming for these scenes is contemporary. The remainder of the musical occurs in ancient Egypt. Some costumes will have a mid-20th century flair similar to the original Broadway production. ACT I Prologue: THE MUSEUM. CROWD: Contemporary attire in neutral hues of white, beige, and tan. AMNERIS: In a glass case attire in muted red: Egyptian helmet crown; sleeveless and strapless; fitted dress or bodice and skirt; half circle cape; gold necklace or collar. ACT I Scene 1: A SLAVE BARGE. EGYPTIAN SOLDIERS: Attired entirely in red: headband; waist girdle, trousers. Optional extras: matching red, high collared Eaton-cut jacket that closes up the front with ties. RADAMES (EGYPTIAN ARMY CAPTAIN): Attired entirely in red to match EGYPTIAN SOLDIERS: Head band; high collared Eaton-cut jacket with gold trim that closes up the front with ties; waist girdle; trousers. AIDA & NUBIAN WOMEN (CAPTURED SLAVES): Complete muted colored ensemble consisting of some of but not all of the following: Head scarf; simple long sleeved dress or tunic; top; skirt; shawl; hip shawl; girdle; sash. ACT I Scene 2: RADAMES’ QUARTERS. ACT I Scene 3: THE DOCKS. EGYPTIAN MAN (OF QUESTIONABLE REPUTATION): Dark, long sleeved, knee-length coat; shirt; waist sash or girdle; trousers. ZOSER (CHIEF MINISTER; RADAMES’ FATHER): Black ankle-length coat/robe with high red collar & red trip closure down the right front; black trousers. ACT I Scene 4: A HALLWAY IN THE PHAROAH”S PALACE. Blue, fitted, strapless, sleeveless bodice. Straight skirt; matching blue scarf. White turban style head wrap with blue trim; white sheet with blue trim wrapped sarong style over (2.). Sleeveless, strapless thy length dress (each a different solid color); matching scarf and dance trunks. SLAVE WOMEN: identical to AIDA; magenta calf-length long sleeve dress; waist sash or girdle. FASSION SHOW: Each ensemble in a single bright color; head piece or wig; gown or ensemble; accessories as needed. ACT I Scene 6: PHAROAH’S PRIVATE BANQUET ROOM. 3 EXOTIC DANCERS: Harem-style attire: Headband or small headpiece; bra-style, trimmed top; matching waist girdle; full, color coordinated chiffon skirt, dance trunks. RADAMES: Red, Knee-length coat with gold trim. Repeat girdle and trousers from I-1. PHAROAH: Gold helmet; crown; gold, skirted, floor-length, long sleeved coat or robe; waist sash or girdle; gold sleeveless caftan. PALACE SERVANT MEN: Dark or print, ethnic pants; matching drape worn off one shoulder. Optional extra: Coordinated shirt or tunic. AIDA & NUBIAN PALACE SERVENT WOMEN (SERVING AT BANQUET): Small, dark purple cap or coif; matching, calf-length, long sleeved dress; waist sash or girdle. 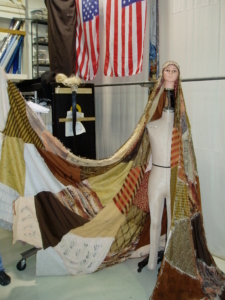 AIDA: Later add coordinated shawl or mantle. AMNERIS: Fitted beige satin bodice with gold trim; matching floor-length skirt and caftan. COURTIERS: MEN: Red, soft, pill box styled cap; matching, long sleeved, floor-length coat; waist girdle or sash. WOMEN: Solid colored, long veil worn on headband; coordinated, short sleeve blouse; matching tapered skirt. GUARDS: Black headband; black sleeveless shirt; black leather harness 9may be worn over shirt or without shirt); black pants; black belt or girdle; black gauntlet gloves. ACT I Scene 7: AMNERIS’ DRESSING ROOM / BED CHAMBER. AMNERIS, AIDA, & RADAMES: Repeat I-6. ACT I Scene 8: THE NUBIAN SLAVE CAMP. MEREB: Repeat I-6. Strike top shirt. AIDA: Repeat I-6. 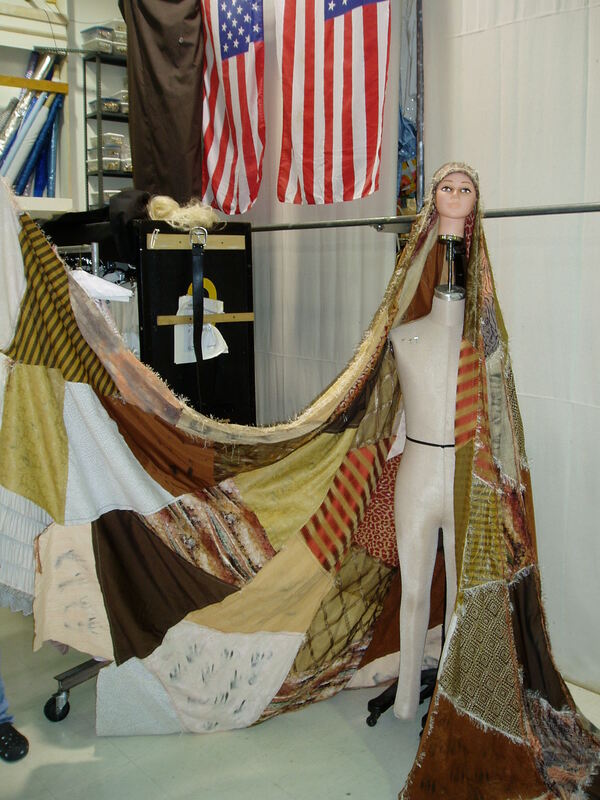 Later add regal, sleeveless, very full surcoat made from man rags and fabrics pieces in brown, tan, beige, and other earth tones. NUBIAN SLAVES & NEHEBKA (WOMAN SLAVE): Complete mens and womens, rages and patched ensembles in browns, beiges, tans and other earth toned colors consisting of some but not all of the following: Blouse; shirt; tunic; vest; trousers; skirt; wrap skirt; dress; breeches. ACT I Scene 9: THE NILE’S EDGE. WASHING DAY. WOMEN DOING LAUNDRY: Matching pink ensembles: Head scarf; bare midriff; sleeveless. Cropped top with elastic at neck and under breast; sarong-style wrap skirt; dance trunks. AIDA & MEREB: Repeat I-8. ACT I Scene 10: THE MARKET PLACE. RADAMES, MEREB & AIDA: Repeat I-9. AMNERIS: Bright orange, fitted dress with gold straps; bright orange shawl or mantle. NEHEBKA: As WOMEN DOING LAUNDRY in I-9 in pink attire: Head scarf; bare midriff, sleeveless, cropped top with elastic at neck and under breast; sarong-style wrap skirt; dance trunks. MEN & WOMEN MERCHANTS (HAWKING THEIR WARES): Complete pink, red and orange ensembles consisting of some but not all of the following: head rag; turban; dress; top; skirt; shirt; pants; shawl; drape; caftan. OTHER EGYPTIAN SLAVES: Repeat PALACE SERVENT MEN AND WOMEN from I-6. 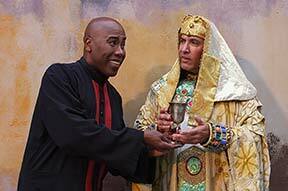 RADAMES & MEREB: Repeat I-10. ACT I Scene 12: THE NUBIAN SLAVE CAMP. AIDA: Simple, black, long sleeved, ankle-length dress; waist girdle or sash. RADAMES: Black, high-collared, long sleeved, knee length coat closing up the front; matching trousers girdle or sash. AMNERIS: Black, fitted bodice with silver or gold straps; matching skirt; caftan or over-piece. ACT II Scene 2: THE PRISON. AIDA: Repeat II-1. Add black shawl or mantle. MEREB: Repeat I-3 (with top shirt). PRISON GUARD: Black headband; black sleeveless shirt; black leather harness (may be worn over shirt or without shirt); black pants; black belt or girdle; black gauntlet gloves. 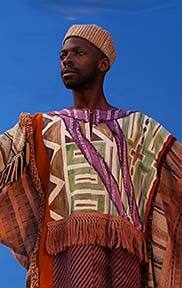 AMONASRO (AIDA’S FATHER THE NUBIAN KING): In slave rag attire: Tunic or shirt; pants or breeches. ZOSER: Black, thigh length, long sleeved coat work open to expose chest; matching trousers or ethnic pants; girdle or belt. AMNERIS: Green dress with gold straps; chiffon over-wrap or mantle. RADAMES: Gray or neutral colored tunic or shirt; coordinated ethnic trousers or pants; belt or girdle. THE MINISTERS: Black, short sleeved t-shirt with red band on left sleeve; black pants with red side stripe. A SLAVE WOMAN, CROWD OF NUBIANS & NEHEBKA: Repeat I-12. GUARDS: Black headband; black sleeveless shirt; black leather harness (may be worn over shirt or without shirt); black pants; black girdle or belt; black gauntlet gloves. ACT II Scene 5: RADAMES’ GARDEN NIGHT. RADAMES: Repeat I-6 with open coat. AMNERIS: Blue dress similar to previous, matching belt; dark blue, purple and/or black floor length caftan. Underdress white chemise or full slip. ACT II Scene 6: AMNERIS’ DRESSING ROOM. AMNERIS: Being dressed into a wedding ensemble: White brocade or textured bridal fabric, high collared, long, sleeved, fitted gown; white satin helmet crown; full veil to encase the body from the top of the crown to dress hem or floor. 4 HAND MAIDENS: Small, dark purple cap or coif; matching, calf-length, long sleeved dress, waist sash or girdle. ACT II Scene 7: THE ROYAL WEDDING. ZOSER & 2 MINISTERS: Repeat I-3. 4 LADIES OF THE PALACE: White blouse, straight white skirt; white chiffon sari wrap. RADAMES: White or cream colored, long sleeved, ankle length robe or coat with full skirt; waist girdle, sash, or belt. PHAROAH: White helmet crown; white, long sleeved, full skirted robe or coat; belt, girdle, or sash; white, silver or gold drape or over-piece. RADAMES: Simple, linen, knee length coat; shirt; ethnic pants or trousers. PHAROAH: Repeat II-7. Strike headdress. RADAMES: Repeat II-8. Strike coat. ACT II Scene 10: THE INTERIOR OF THE TOMB. GUARDS, AIDA, & RADAMES: Repeat II-9. AMNERIS & CROWD: Repeat I-Prologue.